Installation from source code is advised when aiming at extending the framework or getting a deeper impression of its inner workings. The following sections explain some conceptual background and the procedure of installation. 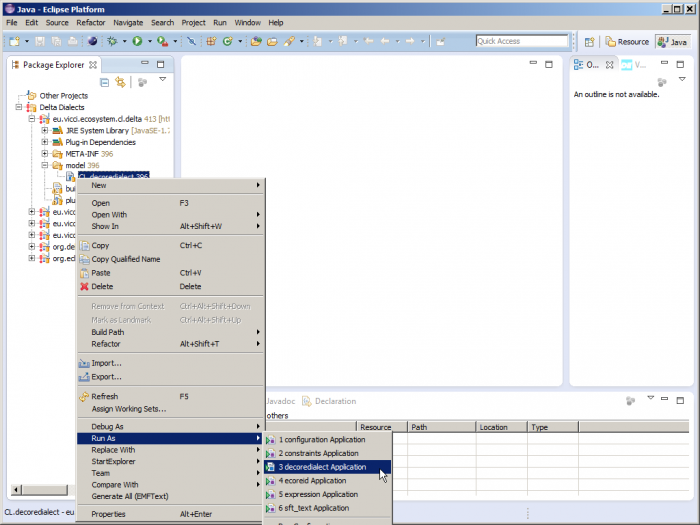 Some preparatory steps have to be performed in order to install DeltaEcore from source code. Install the current release of Eclipse in either 32 bit or 64 bit (does not matter for DeltaEcore). 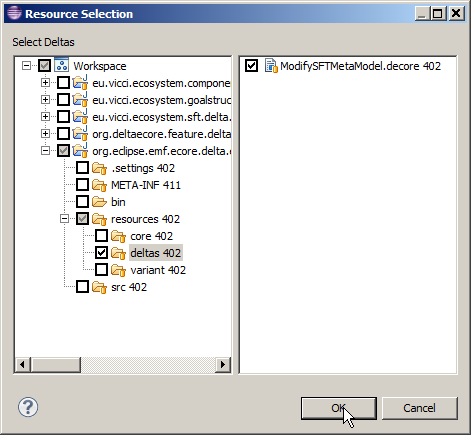 As DeltaEcore builds upon Ecore, the easiest way is to get the “Eclipse Modeling Tools” release as it satisfies almost all modeling dependencies of DeltaEcore. The workspace for DeltaEcore will be created in the further process. Install the current release of the Subversive SVN client. You may, in principal, install any other SVN client, but then the chckout process of the source code and setup of the workspaces has to be performed manually instead of mostly automatically with team project sets. Hence, using Subversive is highly recommended. As Subversive has become an integral part of the Eclipse project, it is recommended to use the regular update site of the used Eclipse release (Subversive features in the Collaboration section) instead of the separate update site of the Subversive project. The installation of Subversive requires the additional installation of an SVN connector. 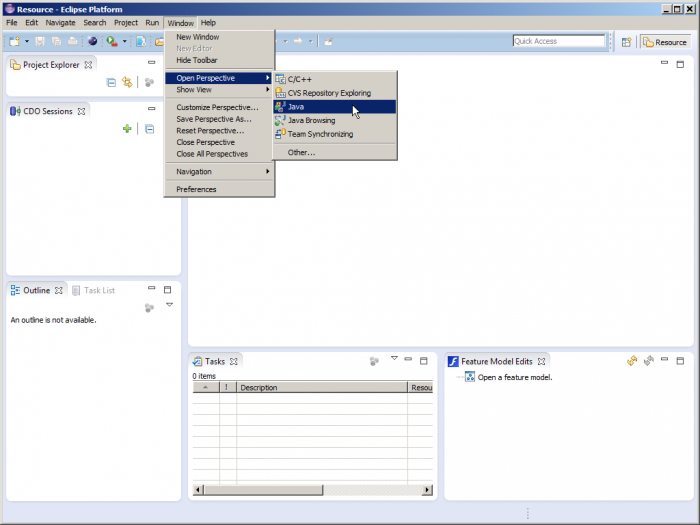 Install EMFText into your Eclipse to create textual languages for Ecore meta models used by DeltaEcore. Framework Developer: Extends DeltaEcore with new functionality. Will modify the source code of the framework. Delta Language Developer: Directly uses DeltaEcore to create new delta languages for source languages, e.g., DeltaJava for Java. Will create delta dialects (*.decoredialect) to extend the common base delta language of DeltaEcore with suitable delta operations for a particular language’s meta model. Variability Engineer: Indirectly uses DeltaEcore to apply delta languages to make language artifacts variable. Will create delta module (*.decore) files and use delta dialects by referencing them in the delta modules. Framework: Workspace of the framework developer. When changes to the framework are to be tested dynamically, a runtime instance of Eclipse can be launched that leads to the Runtime workspace. Runtime: Workspace of the delta language developer. New delta languages can be created here for models that are registered in this instance (e.g., are defined in the framework workspace). When the defined delta languages are to be used dynamically, a new runtime instance has to be started leading to the RuntimeRuntime workspace. RuntimeRuntime: Workspace of the variability engineer. Delta languages can be applied to create variable artifacts. 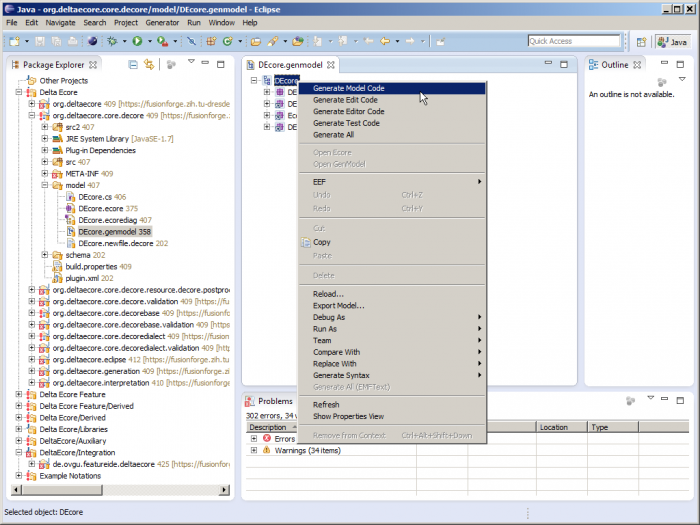 The content of these workspaces will be created in the following sections by checking out the DeltaEcore source code. Setting up the framework workspace requires multiple steps. The following sections explain the procedure step by step. Download the Team Project Set for the Framework Workspace and save it locally to a temporary location. 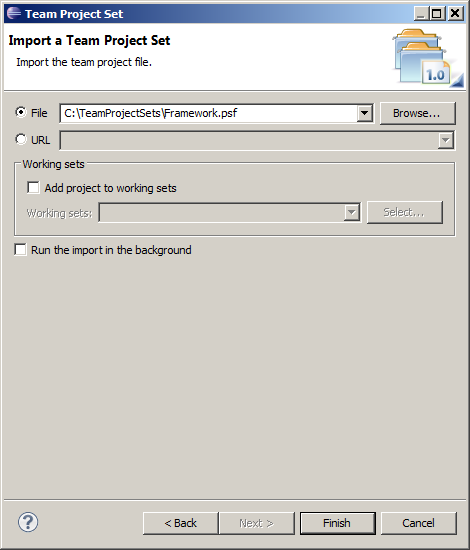 Open Eclipse in the framework workspace and choose File -> Import then select Team -> Team Project Set. In the following wizard page, select File and navigate to the previously downloaded team project set file. Click Finish and enter your FusionForge credentials when prompted. The check out of the source code and the setup of the workspace will take some time. After successful completion, there should be all relevant projects for the framework workspace of DeltaEcore. However, they contain compile errors due to non-existent model code as this is not checked into source control and has to be recreated upon first install. Feel free to delete the previously downloaded PSF file as it’s no longer needed. Note: For a better overview of the projects in the workspace, you can choose Top Level Elements -> Working Sets from the pull down menu of the package explorer and click ok. Many projects contain Ecore meta models that need source code to be generated. By convention, meta models and associated resources are located in a “models” sub folder of the project where applicable. To generate source code, the respective *.genmodel file has to be located within that folder and opened. Right click the root node of the genmodel and select Generate Model Code. Note: The order in which the projects are processed does not matter. Some of the projects require additional code to be generated from the meta models, such as the edit or editor code. This code is generated in a similar way to the model code: Open the genmodel, right click the root node, but select Generate Edit Code or Generate Editor Code, respectively. DeltaEcore uses multiple textual languages in the framework and as example notations. These textual languages were created using EMFText and need their respective source code generated. To generate source code for EMFText language locate the *.cs (concrete syntax) file in the model folder, right click it and select Generate Text Resource from the context menu. Note: If there are build errors marked within the *.cs files, the most likely reason is that you installed the official EMFText release but not the most recent version from the update site (see above). Some projects may still contain compilation errors. Here are appropriate measures to deal with the problems. This project integrates DeltaEcore into FeatureIDE. The remedy to the compilation problems depends on whether you want to use this integration or not. Problem: Dependencies to FeatureIDE cannot be resolved. 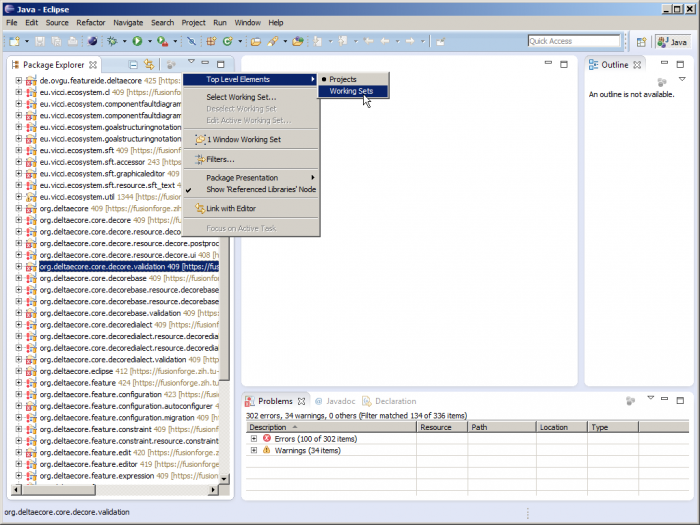 If you do not want to use the project: Just close the project in Eclipse. Note that versions of the JVM starting at and above 8.0 do not support (or require) these arguments anymore. Under Main, use as Location the relative path to the previously created DeltaEcoreRuntime workspace. The changes of memory allocation in the runtime instance of Eclipse are not mandatory but alleviate the problem of running out of memory, which happens quite often with the modeling tools in general. Finally, execute the run configuration to transition to the runtime workspace. 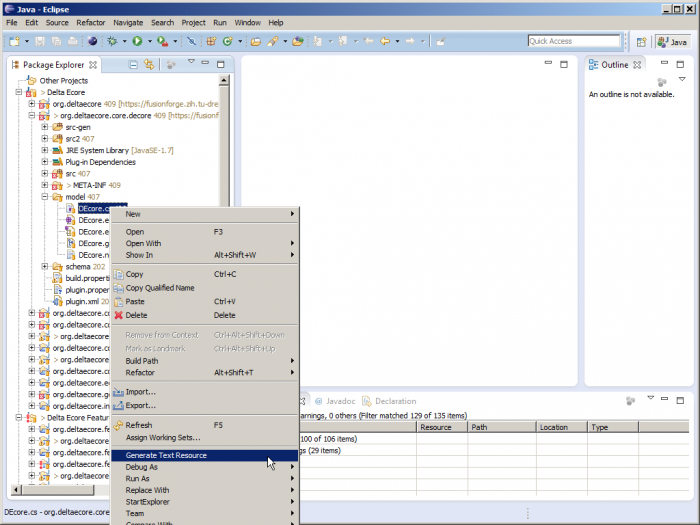 The process of setting up of the runtime workspace is similar to that for the framework workspace but is a lot easier. 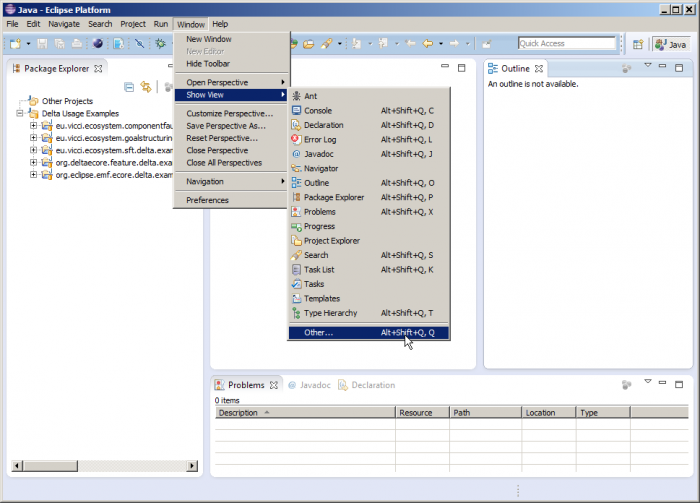 To ease the setup process, leave the initially selected “Resource” perspective of Eclipse and go to the “Java” perspective by selecting Window -> Open Perspective -> Java. 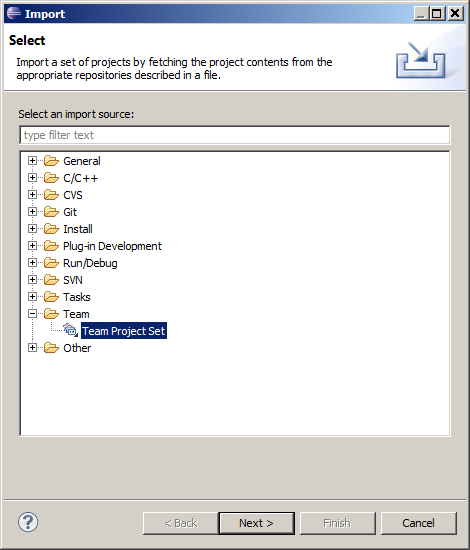 Download the Team Project Set for the Runtime Workspace and save it locally to a temporary location. Import the team project set into your workspace similar to before. The runtime workspace contains several projects that each define an example delta dialect. The example delta dialects of DeltaEcore each require a partial interpreter that is automatically plugged into DeltaEcore during runtime. To generate the respective source code, the *.decoredialect file has to be located. Right click the file and select Run As -> decoredialect Application. 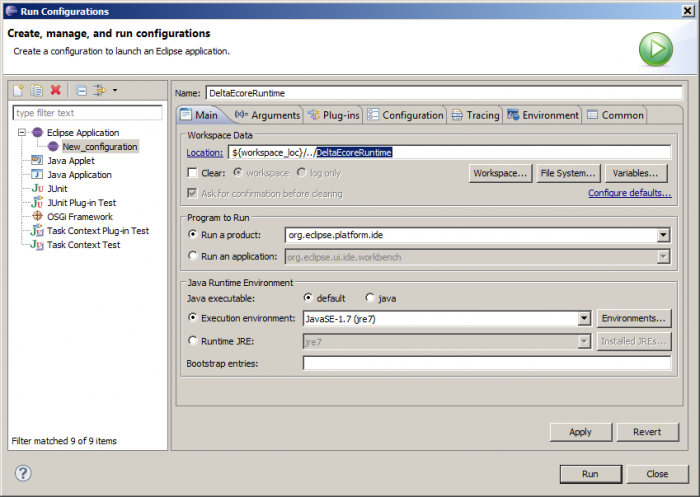 Set up the run configuration for a new Eclipse instance similar to before but now use as location the relative path to the previously created DeltaEcoreRuntimeRuntime workspace. 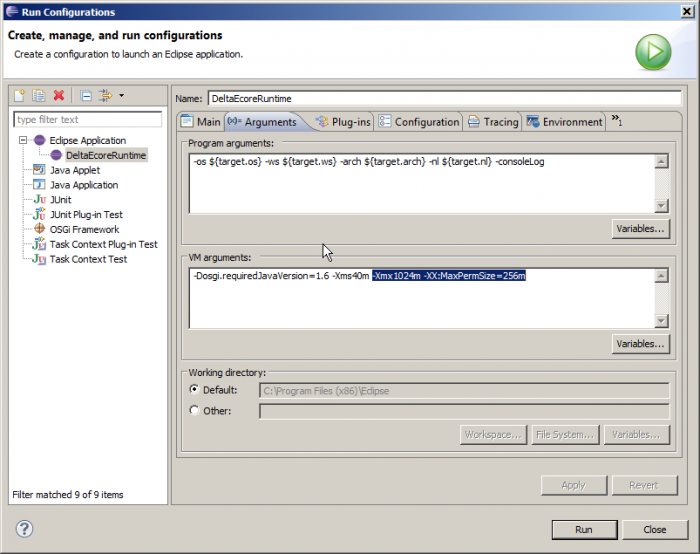 Finally, execute the run configuration to transition to the runtime runtime workspace. The process of setting up of the runtime runtime workspace is similar to that for the runtime workspace. 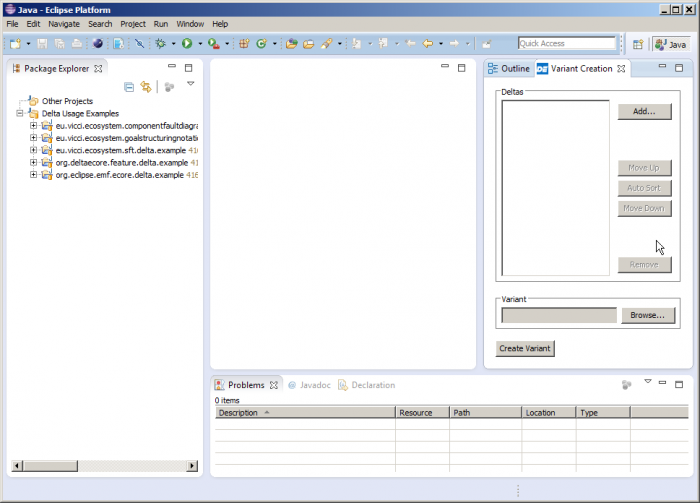 Again, go to the “Java” perspective of Eclipse. Download the Team Project Set for the Runtime Runtime Workspace and save it locally to a temporary location. Import the team project set into your workspace similar to before. The runtime runtime workspace contains several projects that each contain an example of using the delta dialects of the runtime workspace. The example projects each contain at least on *.decore file specifying delta modules that use the previously defined delta dialects to modify selected models to perform changes associated with variability. Integrated feature model mode: Uses the Hyper Feature Models of DeltaEcore and a mapping of feature expressions to delta modules. FeatureIDE mode: Uses FeatureIDE as front end and a mapping to delta modules for DeltaEcore as backend. Only the raw mode is explained here briefly even though the other two options are more comfortable for end users. However, the raw mode introduces the least overhead in terms of additional procedures called in the framework and is, thus, most suitable during framework development. Select Window -> Show View -> Other… from the Eclipse main menu. 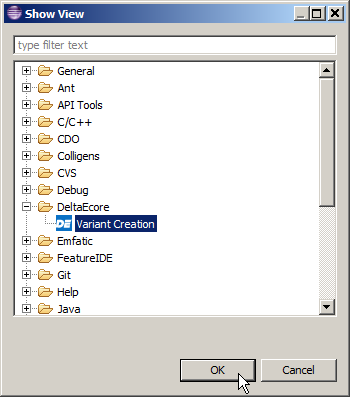 Select Variant Creation from the category DeltaEcore. 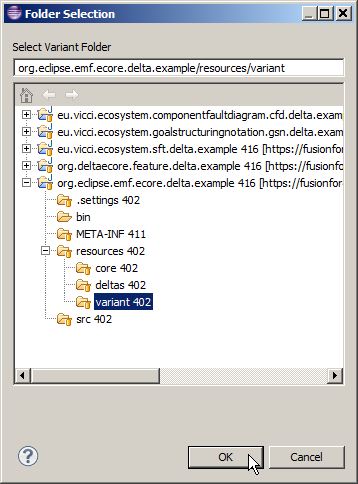 The Variant Creation view of DeltaEcore appears. Click Add… and select a set of delta modules. Click Browse… to select a folder where the respective variant should be located. Click Create Variant and see the respective elements of the derived variants in the respective folder. Note: Explanation of the other methods of variant derivation will be explained at some future point and will be located in the general documentation section.